Government initiatives to improve the economy of the country, rising investments and expanding urban population with developing income level are acting as the key drivers for growing air conditioners market in Nigeria. Further, with intensifying construction activities in residential and commercial sectors, the market is expected to register growth in the coming years. Southern region of the country is the key revenue generating region in the overall market. Lagos city has led for the growth of the southern region as compared to northern region. Also, with upcoming mega projects in the city demand for higher tonnage air conditioners would surge. •	Historical & Forecast data of Nigeria Air Conditioner Market Revenue for the Period 2010-2022F. •	Historical & Forecast data of Nigeria Window AC Market Revenue & Volume for the Period 2010-2022F. •	Historical & Forecast data of Nigeria Split AC Market Revenue & Volume for the Period 2010-2022F. •	Historical & Forecast data of Nigeria Floor Standing AC Market Revenue & Volume for the Period 2010-2022F. •	Historical & Forecast data of Nigeria Cassette AC Market Revenue & Volume for the Period 2010-2022F. •	Historical & Forecast data of Nigeria Packaged AC Market Revenue & Volume for the Period 2010-2022F. •	Historical & Forecast data of Nigeria Ducted Split AC Market Revenue & Volume for the Period 2010-2022F. •	Historical & Forecast data of Nigeria Centralized AC Market Revenue for the Period 2010-2022F. •	Historical & Forecast data of Nigeria Centralized AC Market Revenue, By Components for the Period 2010-2022F. 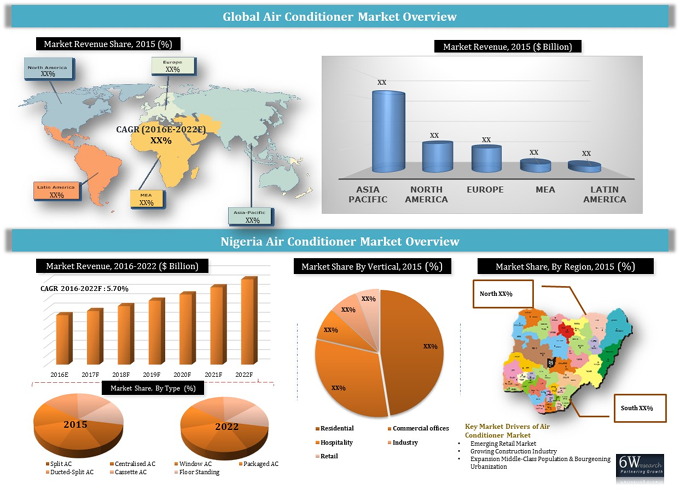 •	Historical & Forecast data of Nigeria Air Conditioner Application Market Revenue for the period 2010-2022F. •	Historical data of Nigeria Air Conditioner Regional Market Revenue for the Period 2010-2015. •	Market Size & Forecast of Nigeria Air Conditioner Regional Market Revenue until 2022F. 11.6	Midea Group Co., Ltd.
11.9	Qingdao Haier Co., Ltd.
11.10	Samsung Electronics Co., Ltd.
Nigeria Air Conditioner market is projected to grow at a CAGR of 5.70% during forecast period 2016-2022 owing to growing construction activities, expansion of infrastructure facilities such as airport and metro, rising retail and increasing public-private investments in residential & commercial sectors. Nigeria Air conditioner market report has been segmented into equipment types, end user applications and regions. The major companies in Nigeria's air conditioner market include - Carrier Corporation, Panasonic Corporation, Chigo Holding Limited, Daikin Industries, Ltd., Johnson Controls, Inc.(York), LG Electronics, Inc., Midea Group Co., Ltd., Qingdao Haier Co., Ltd., Samsung Electronics Co., Ltd. and Trane Inc.